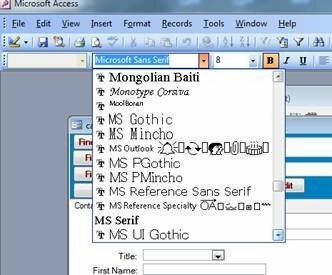 When you reset the font size to 100%, it impacts on MS Access. MS Sans Serif disappears from the available font list. Save as FontFix.reg, or download it from here then unzip it, double click the file and add it to the registry. I have done the fix and it still has huge fonts on my graphs. I downloaded it, ran the program and restarted my computer. The font show up, but the problem still hasnt been fixed. 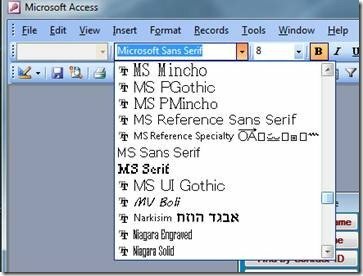 Hi there – If MS Sans Serif is showing in the list of fonts available within Access you might need to change the font size. However, this post was written in 2010, so it is quite possible that the fix no longer works.